The Southern water vole was once considered a subspecies of the European water vole however, it is now considered a separate species, in part due to significant morphological differences. The Southern water vole is a small rodent with a rounded muzzle, rounded body with barely visible small ears. The fur which is much thicker than on other voles is dark brown or blackish on the back and lighter on the flanks and under-parts. The tail which is about 10cm long is covered in short, stiff, sparse hairs. The body is between 16 and 23cm and they weigh 150 to 280 grams. The Southern Water Vole, Arvicola sapidus, only occurs in freshwater habitats in parts of France, Spain and Portugal, where it is found from sea level to a maximum of about 2,300 metres in the Pyrenees (Le Louarn and Quéré, 2003). In France the Southern water vole remains relatively common in only three regions: Charente-Maritime, Brittany and southwest France (Pyrenees), though its distribution is still patchy in these areas. 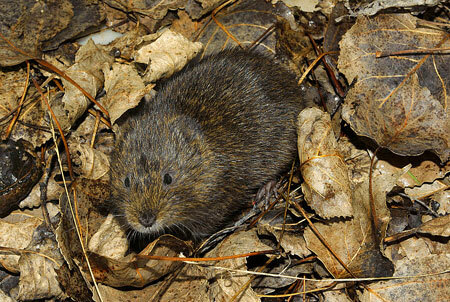 In the French départements of Drôme, Var, Alpes-Maritimes, Hautes-Alpes, Alpes-de-Haute-Provence, Loire, Rhône and Ain, the water vole has become rare, with a maximum of only 10 locations per département. In the Ain there is only one location, two in the Rhône and no more than 6 or 7 in the Hautes-Alpes. As recently as 20 years ago it was thought to be present across France and reasons for the decline are as yet unclear. It is almost always found near to water, preferring small freshwater lakes, ponds and slow-moving rivers and streams with dense bank side vegetation (Saucy 1999, Fedriani 2002). They sometimes are found in drainage ditches and wet fields. Abundant vegetation and bank sides suitable for water vole burrowing activity seem to be essential characteristics of water vole habitat. Its diet consists mainly of aquatic plants, grasses, and herbs, although small animal prey are occasionally taken (insects, fish, tadpoles, freshwater shrimp). The burrows of the water vole typically have two entrances, one primary entrance above water level and one underwater entrance. The water vole is mainly active during the day, with two peaks in activity in late morning and early afternoon, as well some nocturnal activity. It is active throughout the year, with no period of hibernation. Photo. 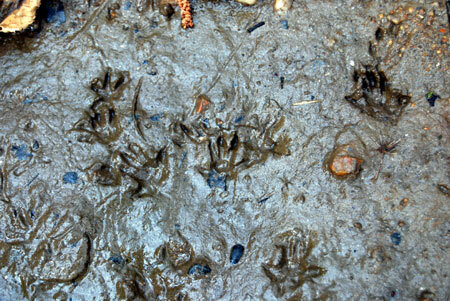 Water vole prints - traces are difficult and often inconclusive. Reproduction occurs between March and October, with 3 to 4 litters of 2 to 8 young per litter.. The gestation period is 3 weeks. Sexual maturity is reached at 5 weeks old and the life span of the water vole varies from 2 to 4 years. The water vole lives in small family groups and, under optimal conditions, its density may reach 5 individuals for every 100 meters of riverbank (Saucy 1999, Palomo and Gisbert, 2002). There have never been any records of damage to human activity or agriculture by the Southern water vole unlike the European Water Vole Arvicola amphibious in its terrestrial form with which it could be confused. 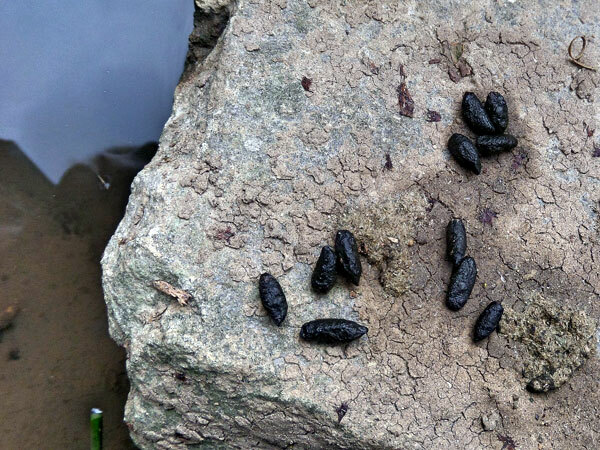 Secondary poisoning with anticoagulant rodenticides (Bromadiolone and Chlorophacinone) intended for the Brown rat, Coypu and Muskrat. Competition for habitat and food sources with the Muskrat and Coypu. Predation by the American Mink, Polecat and Brown rat, as well as domestic dogs and cats. Trapping and shooting of “vermin”. Habitat modification, including draining of suitable wetlands, dredging, canal-building, disturbance by human activity and livestock, etc.. Drastic variations in water level caused by dams or seasonal droughts. Pollution and possibly disease and parasites. In theory since the prohibiting of the use of chemical poisons for “vermin” in exterior environments from 1st July 2012 the poisoning issue should be greatly reduced. Décret n° 2012-402 du 23 mars 2012 relatif aux espèces d'animaux classés nuisibles. Also the amphibious vole (Arvicola sapidus) was placed in the category of a fully protected species by law in France since October 2012. This decision published in the Official Journal 06/10/12 was taken by Order of 15/09/12 co signed by MEDDE (Minister of Ecology, Sustainable Development and Energy) and MAFF (Ministry of Agriculture, Food and Forestry), amending the protected mammals order of 23.07.07. Previously known as Arvicola. Terrestris. Linnaeus proposed both amphibius and terrestris in 1758 on the same page,they are now considered conspecific by most researchers. Although this species is protected in the UK due to threat of extinction there, no such protection applies in France where it is considered to be vermin in its terrestrial form. LINK HERE.